Turmeric is an ancient root related to the ginger family. Native to Southeast Asia, it is often found in curries, giving the food its brilliant, golden orange colour. Turmeric is used as a balancing ingredient in Ayurvedic diets and is associated with many benefits. 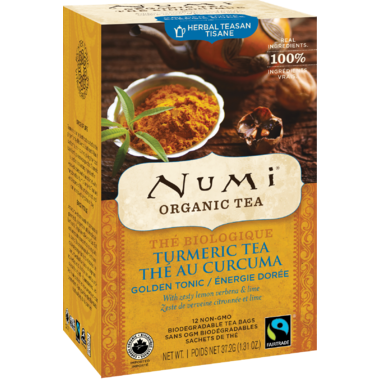 Numi's Turmeric Teas are a rich source of this amazing root and can be enjoyed any time of day. Country of Origin: Madagascar. Numi is proud to contribute incremental funds to our new Turmeric partners in Madagascar and help facilitate their transition to Fairtrade Certification. I was interested in this tea b/c the other Numi teas I have tried have been of very high quality. Turmeric is a powerful anti-inflammatory, and benefits I noticed over the few weeks I drank it were a clearing of skin irritations and less joint pain. The tea has a strong smell and taste, but was surprisingly balanced by the lime included in the blend. It is definitely energizing, and I wouldn't recommended to drink before bed. I would buy this again.